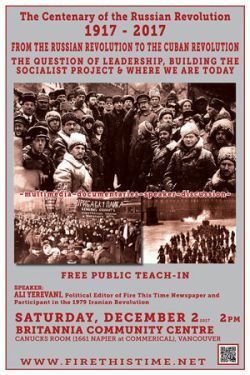 The Russian socialist revolution of October 1917 changed the course of human history. Millions of working class, the dispossessed class, women, peasants and soldiers though their class and political consciousness decided to write history from their own point of view in favour humanity. An overwhelming majority of oppressed people overthrew capitalism and successfully registered the first socialist revolution on earth. The Russian Revolution was biggest proof of Karl Marx and Friedrich Engels claim that capitalism in decay is to be dismantled. > What were the factors for the failure of capitalism in Russia? > What were the factors of the Russian Revolution to win? > What role did the Bolshevik Party play in the course of the Revolution and its victory? > Who did the Revolution and how did they do it? > What did Bolsheviks understand of the vision, program and the nature of Russian Revolution? > Why does leadership play a decisive role in the victory or defeat of any revolution? > What is the meaning and function of concepts such as dictatorship of workers, democracy, soviets, central planning and socialist economy? > What is the relevancy of the Russian socialist revolution for the revolutionary movement today? > What kind of program and leadership is needed for socialist revolution today? > Why, among all socialist revolutions, is the Cuban socialist revolution the true continuity of the Russian Revolution?